Welcome to BankruptYourStudentLoans.com, the website dedicated to helping honest debtors struggling with student loans to discharge or reduce their debts through bankruptcy or other means. Are you considering or entering into bankruptcy and want to include your student loans? Don’t let others tell you it is impossible to bankrupt your student loans. It is possible and you can do it yourself. We give specific details on how to file an adversary proceeding in conjunction with your bankruptcy to have the court determine if repaying your student loans create an “undue hardship” and should be discharged. Have you already been through bankruptcy and only now learned that you may have been able to include your student loans. We now have explicit information on how you can reopen the bankruptcy for the purpose of discharging your student loans. Perhaps you are not considering bankruptcy but want to explore filing a Compromise or Write-Off? We give concise information on these strategies and the keys for effective negotiations with the lender. Many other discharge strategies are discussed. You can do it! No attorney needed! Remember, if you do not try to have your loans discharged, you will be stuck with them—possibly for the rest of your life. There goes your dream of owning a house and more. Filing fees are zero. You have nothing to lose. We will show you how. Besides focusing on the direct needs of debtors to obtain discharge of their student loan debt, we are here to help organize community efforts to affect the political process to address the student loan debt morass. 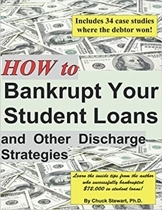 Now, Chuck Stewart is making his book “Bankrupt Your Student Loans and Other Discharge Strategies” available as a FREE pdf. If you want a hard copy, you can still buy it from Authorhouse. I’m hoping that the tens-of-thousands of people who qualify to file an adversary proceeding to do so. If we can get just 10% of those who qualify to file, I believe the entire student loan industry would collapse. Click here to download the entire book. Direct link to AuthorHouse for the fastest delivery. Buy it here and save $5 over list price. Buying the book gives you the right to become a member of this website and access to many downloadable forms, how-to videos for filing the adversary proceeding, discussion forum, and more. Download the Introduction and Chapter 1 to see if it can help you. Download the summative essay on how to file an adversary proceeding to determine if your student loans can be bankrupted. R.W. simply white-out sections of the sample documents found in the book, hand-printed in his information, filed, and won a discharge of his entire student loan debt of $225,000. Laura M. -- "I found myself unemployed and in a financial downward spiral last year, unable to keep up with all my bills, including my student loan which had tripled in size (over $100K) over the last 20 years, the option left was BK. I purchased Chuck's book to deal with the student loan portion. It became my bible - getting me through the Adversary proceedings and ending with a fair settlement with DOE. I do believe I wouldn't have reached the end without the help of this book." So, how many people are successful? Academic researchers Rafel Pardo and Michelle Lacey (2005) found that, “More than half (57%) (of student loan debtors who filed an adversary proceeding were). . . granted some form of relief (through bankruptcy).” And this research was done before the advent of this book. Just imagine how many more people are successfully discharging their student loans through bankruptcy! Read more at the University of Cincinnati Law Review. What is missing from all these studies is an analysis of cases that never make it to trial. Chuck Stewart, author of the book, is such a case. I settled with the Department of Education for 10% of the total—i.e., pay $50/m for 10 years. As such, his case is not counted in these studies. It is estimated that half of all adversary proceedings do not enter into trial. The DOE would rather come to some agreement rather than potentially lose a case in court that would affect all future cases. Regardless, if academic research says 60% or 40% of adversary proceedings are successful (and I believe the real number is 80-90% when you take in all cases that are settled out of court), the important thing is to file. It costs nothing to file. I believe, if just 10% of those who could file were to do so, the system would collapse. DOE simply does not have enough attorneys to handle that many cases. That would force Congress to take action and alleviate the bad law. Not only is this website dedicated to helping individual debtors with their student loans, but serves as an advocacy for changing law to re-specify student loans back to their original status as unsecured debt dischargeable directly through bankruptcy. Looking for someone to help? The attorneys and others listed with this referral are making a special effort to help debtors with overwhelming student loans. Are you an attorney specializing in student loan debt? Come and join our list of nationwide legal services. There are many community resources that provide free or low-cost legal consultation and representation. The student loan mess has spawned many activist groups interested in political action. Perhaps you want to participate?